Example: You have an element with a width of 200 and a border of 5 pixels and padding of 10 pixels. 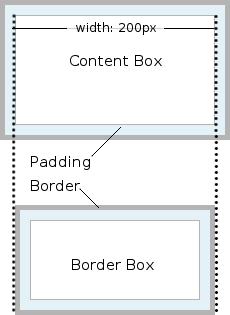 "Box-Sizing: Content-Box" Will make the total width of the element 230 pixels leaving 200 pixels for content. "Box-Sizing: Border-Box" will produce an element with the width of 200 pixels this leaves only 170 pixels for the actual content box itself.